If you've followed me for a while, you know that I like the Vital Proteins brand. More specfically, their collagen peptides. So today, I wanted to share with you guys WHY. Collagen is a protein that we naturally produce in our bodies, which slows as we get older. Taking a collagen supplement is great for your hair, skin, and nails. Collagen is what helps give your skin its elasticity. 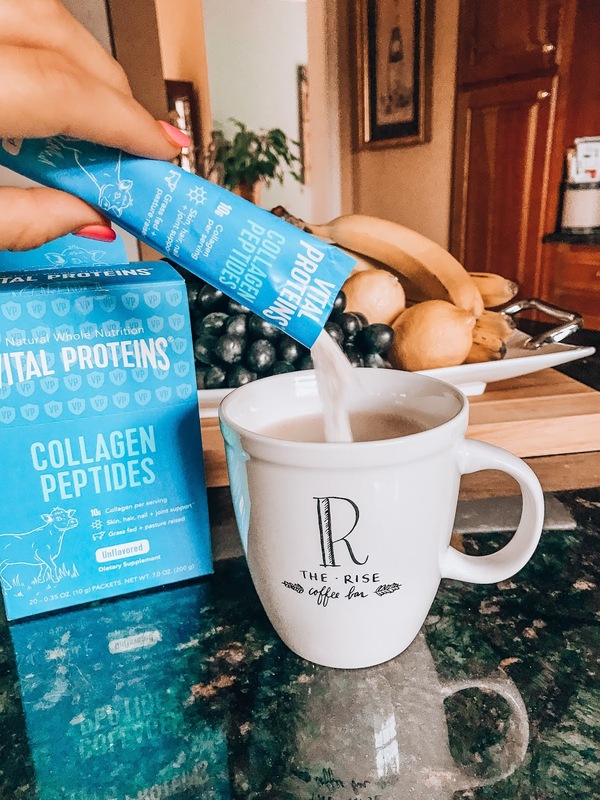 The collagen peptides from Vital Proteins have 10g of collagen and 9g of protein per serving! Totally flavorless and odorless. I also love the easy/pre measured sticks that I'm using right now. I knew I loved this stuff for its benefits, but what got me hooked was when my hair dresser noticed! She asked me what I was doing different or if I was taking any vitamins because my hair was growing out thicker than usual. Yay! I had been taking collagen peptides for 2-3 months before she noticed, which is normal, so don't expect immediate results. I add these collagen peptides to the bulletproof coffee that I drink every morning. To turn your coffee into "bulletproof coffee", add a hefty slice of grass-fed butter and a generous spoonful of organic unrefined coconut oil-and blend. To see my morning coffee recipe & more info on bulletproof coffee on a past blog post, CLICK HERE. Thank you Vital Proteins for your awesome products!